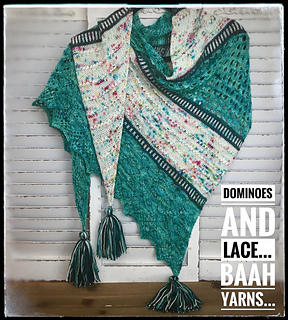 Dominoes & Lace was designed for the 2019 MN Yarn Shop Hop for Amazing Threads by Wandamae Kafka. 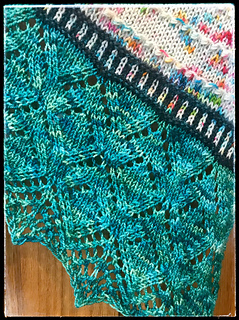 Mira of Baah Yarn dyed 3 exclusive colors of Baah LaJolla for Amazing Threads: Pips, Domino Effect & Chain Reaction. Only available at Amazing Threads: www.Amazing-Threads.com Our theme this year is “Inspired by Games” we are inspired by colorful dominoes. This pattern combines texture and lace stitches to create a lovely shawl which increases on the diagonal. Size: 70” wingspan, 30” depth. Gauge is not important. 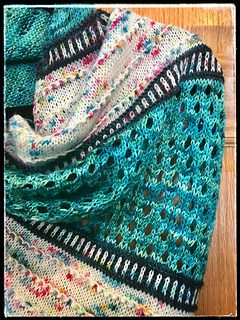 However, if you are tight knitter go up a needle..loose knitters go down a needle.